In the face of harsh repression like this, there may only be one real option for the opposition to effect meaningful short-term change: get rough or stand down; confront a coup with a popular countercoup, or wait and hope for better days. I know it is vastly easier for me to sit back here in the States and comment that either the opposition organizes mass street action in which it is willing to inflict and take substantial casualties or it almost inevitably fails in its clearest near-term objective, but that probably is, I fear, the bottom line in this particular instance. ….I was watching the iPod bit last night in which, what, less than a dozen police on motorcycles with nothing more than batons took on a dense crowd of a thousand or more at close quarters. Instead of largely heading for the hills, such a crowd could easily have closed in behind the police and taken them all down, not just one. The tipping point in many of these situations is when the police become either as fearful as the demonstrators, more so, or even grow thoroughly sickened by the violence they have been ordered to carry out. That crucial moment is far less likely to come if demonstrators stand down or shrink back in the face of the mere threat of violence. 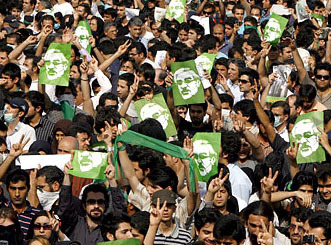 On the other hand, upwards of half a million Mousavi supporter marched silently through Tehran on Monday. It’s not over yet.